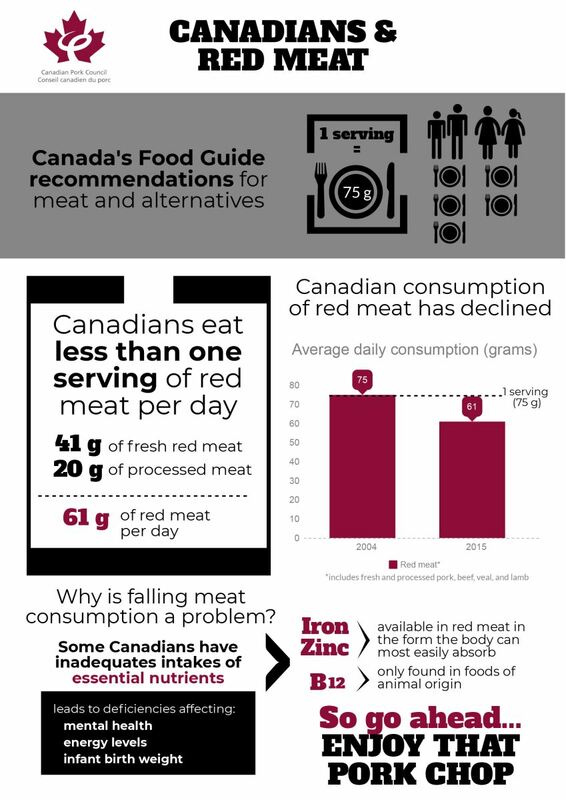 In fact, most Canadians consume a quantity of red meat that is well within Canada’s Food Guide recommendations. As a refresher, the Food Guide advises teen girls and adult women have 2 servings of meat and alternatives a day, whereas it is 3 servings a day for males. A serving of fresh meat is 75 grams. Let’s look at the data from Statistics Canada surveys to get a handle on how much red meat Canadians actually eat. The Canadian Community Health Surveys, conducted in 2004 and 2015 using 24-hour dietary recalls, found red meat (fresh and processed) declined 14 grams from 75 grams to 61 grams. On average, Canadians are consuming red and processed meats within the amounts recommended in Canada’s Food Guide. 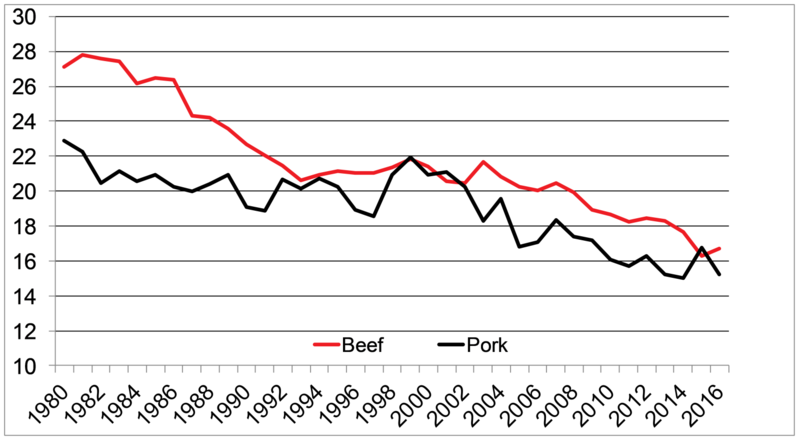 This decline in meat consumption is validated by Statistics Canada’s disappearance data where the net supply is divided by the Canadian population. So, what would be the harm if Canadians further reduced their red meat intake as touted in the popular press? It could certainly exasperate an already concerning situation of inadequate intakes of essential nutrients; especially for women. According to Health Canada’s Evidence Review for Dietary Guidance, a significant number of women - 48% of women 31-50 years of age and 69% of females older than 70 years of age - are already consuming less than the recommended number of servings for meat and alternatives. Incidentally, so are 56% of adolescent males. Perhaps not surprisingly, the same report noted some Canadians – especially women and older adults – have inadequate intakes of iron, zinc, and vitamin B12. Iron and zinc are available in red meat in the form that the body can most easily absorb and vitamin B12 is found only in foods of animal origin. Of concern, is that further reductions in red meat consumption by these population groups may lead to deficiencies affecting mental health, energy levels, and infant birth weight. Certainly some Canadians would benefit from eating more meat. The real public health concern should be the astonishing consumption of ultra-processed foods. New research commissioned by the Heart and Stroke Foundation of Canada shows that ultra-processed food consumption in Canada continues to increase and is alarmingly high, accounting for almost half of our daily calorie intake. This includes fast food, sugary drinks, snacks, chips, candies, cookies, sweetened milk products, sweetened cereals, and sauce and dressings. Ultra-processed foods provided 48% of the total daily energy intake whereas fresh and processed red meats contributed only 8% of total energy intake. For most people, balance needs to come from swapping refined grains and empty calories for whole grains and vegetables; not reducing meat.